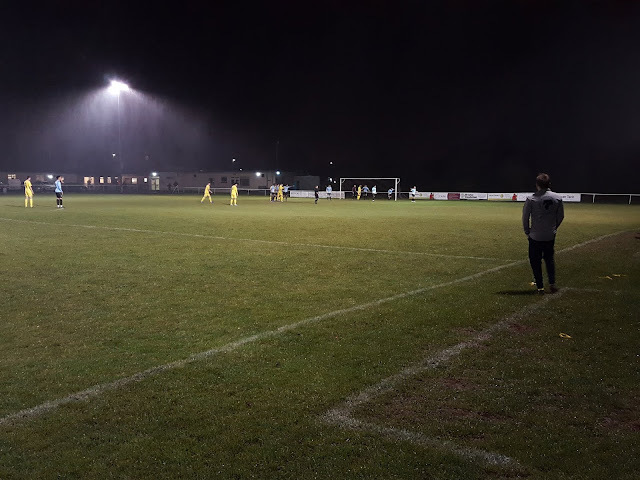 My twenty-ninth ground of 2018 was on Tuesday 6th November at Longwell Green Community Stadium in Longwell Green, Gloucestershire. The match was Longwell Green Sports vs. Wells City in Western League Division One. The Longwell Green Community Centre is in the suburb to the east of Bristol just over the border in Gloucestershire. 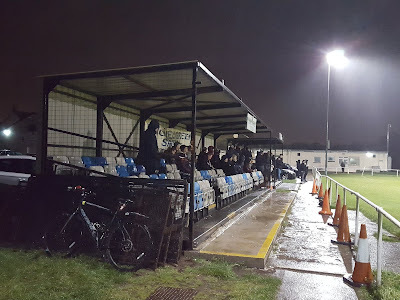 As the name alludes to the ground is park of a community area with the village's community centre building just beyond the north-west corner of the pitch. The surrounding area predominantly consists of housing though there is a parcel of green space to the north and to the east where there is a 90% scale pitch and two mini-pitches. The venue is 2 miles north of Keynsham railway station and has been home to the club since it was formed in 1966. The west side of the ground is the primary one. As mentioned the north-west corner has the community centre building and next to this is the football team clubhouse including a bar. To the south of this is the main car parking area through there are a handful of spaces in front of the clubhouse right by the pitch. If you happen to poach one of these spaces you can actually get a full view of the action from inside your car. Towards the half-way line there are two separate stands. The smaller of the two is a four-level covered metal terrace with the other an all-seater structure with room for 100 spectators. Towards the other end of the field there is hard standing by the pitch and a thin grass section due to the fact there are concrete mini pitches carved out of the wider car parking area. The opposite side of the pitch has the two dugouts but with trees separating the arena from the additional pitches next door this is the narrowest side of the ground for spectators. There is a strip of hard standing all the way along with a slim grass area behind this. The areas behind the two goals are similar, both have hard standing for the whole length with grass sections behind this. The southern end is more confined as it has a fence not far back from the goal to separate the site from the adjacent houses. 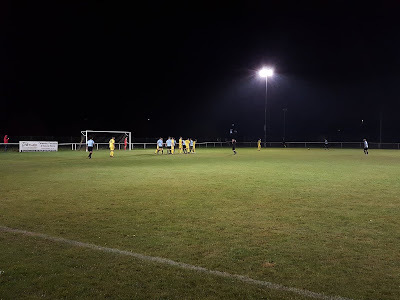 Longwell were coming off the back of a 6-1 defeat the previous Saturday and Wells went at their leaky defence from the outset having a series of corners in the opening minutes. This paid off on the quarter-hour when a corner from the right was met by a bullet header from James Bayliss who flew into the back of the net. The home side rode this period of pressure without conceding another who was key as they came back into the game in the middle of the half. In the 27th minute a cross to the back post from the left found Luke Bryan but he was always stretching to reach the ball and could only flick the ball over the bar from close range. Wells did not heed this warning though and a couple of minutes later the ball was sent over to the back post again and this time Bryan was able to get the ball over the line. The half ended with the visitors going close when Steve Sokol dragged his shot from 20 yards just wide of the post. 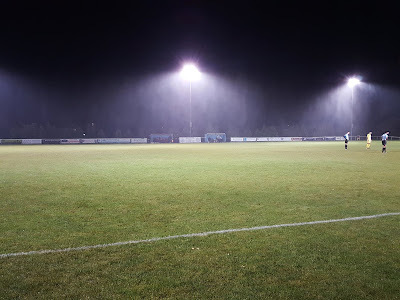 The second half was a real goalfest which started in the 48th minute when Wells edged ahead again - a cross from the right caused a mix-up in the home defence and as two defenders went for the ball they spilled it to James Bisgrove who slammed into the corner from six yards. Two minutes later and parity was restored as a corner from the right found the head of Luke Bryan who headed down into the bottom corner to grab his second of the game. In the 67th minute an extraordinary goal saw Longwell take the lead for the first time on the night. Goalkeeper Luke Perry punted his goal kick down field and the strong wind took it all the way to the opposite penalty area. Visiting keeper Thomas Creed misjudged the bounce and the ball went over him and over the line as he desperately scrambled back in vain to prevent his opposite number scoring. Longwell were playing with confidence now and with a quarter of an hour to play scored a fourth goal - this was the goal of the game as a lovely passing move was finished off by Danny Carter's delicate 25 yard shot into the roof of the net. Two minutes later and Longwell almost scored again when a free-kick was lofted into the area and a header came back of the post. With the game looking comfortable enough the away side then scored a quick-fire double to stun the hosts. Charlie Crook netted both of them with the second a really good effort as he cut inside from the right wing and unleashed a curling effort into the top corner on the other side of goal. The scores were now tied at four but the drama wasn't over as Longwell were awarded an 87th minute penalty. Luke Bryan stroked the spot-kick low to the keeper's left to secure his hat-trick and a 5-4 win for his team.